Traditional Albanian cuisine is largely meat-based and vegan dishes are a little tricky to come by in restaurants in Tirana. The cuisine is heavily inspired by the Mediterranean cuisine and rich in olives, dairy products, citrus fruits, and fish. There is an abundance of locally grown food, included, but not limited to potatoes, carrots, beans, cabbage, cherries, citrus fruits, walnuts, figs, and almonds. If you are a lover of home cooked meals you have heaps of fresh, locally grown fruit and vegetables at your disposal. 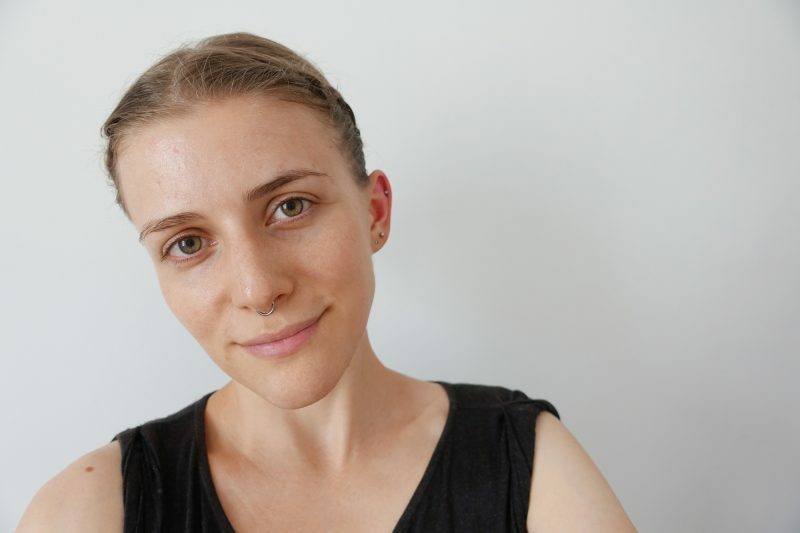 If you are keen on eating out more than cooking yourself then it may be a little tricky however, vegan options are available although limited. Supermarkets and local street vendors offer a great selection of local fruit and vegetables and are a great source for fresh food and pantry staples if you are planning on cooking at home. 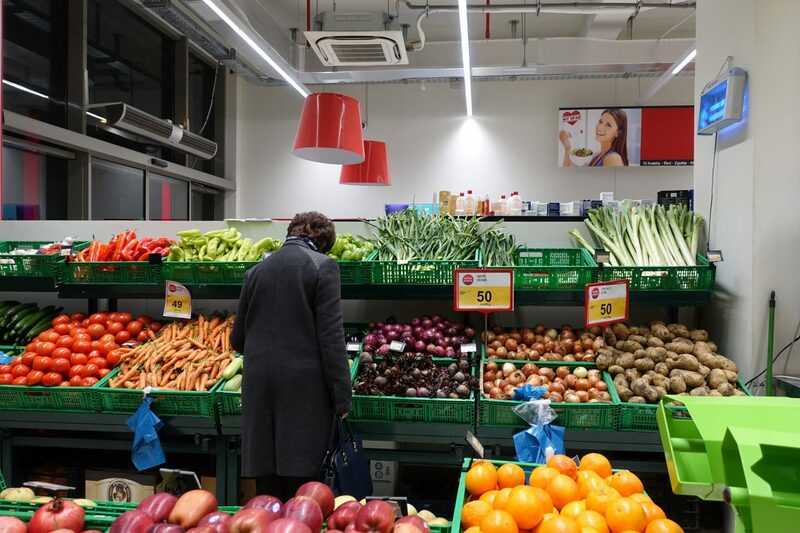 There are quite a few smaller shops in and near the Blloku district that offer local specialties and, just like the supermarkets and small vendors, locally grown fruit and vegetables. 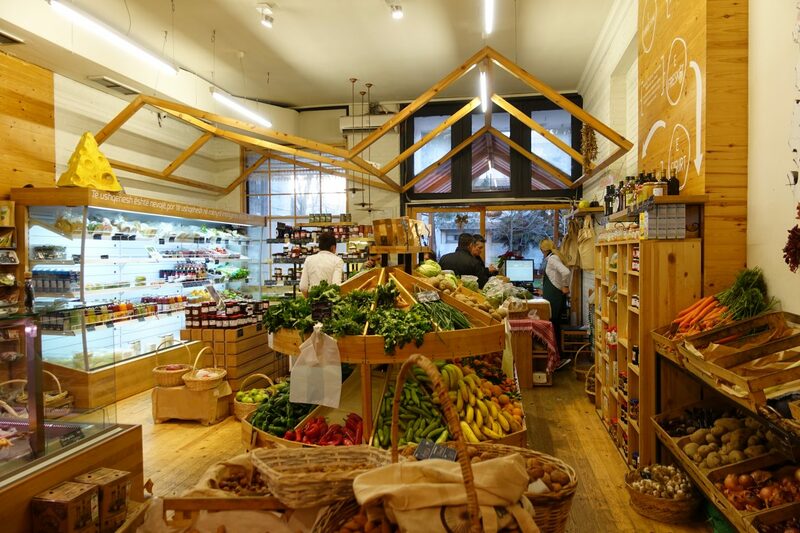 MIA Organic on Rruga Papa Gjon Pali i II has a great selection of pre-cut salads in bulk, beans, juices, jams, and beans. They also have a map on the wall highlighting the areas of Albania from which their products are coming from. Natyral & Organik on Vaso Pasha 3 is also worth mentioning, it’s a small shop offering herbs, oils and locally made preservatives. For delicious vegan food, you can head to Veggies on Rr. Brigada VIII, it’s a lovely vegetarian restaurant in the heart of Tirana and almost everything on their menu can be easily made vegan (if it isn’t vegan already). 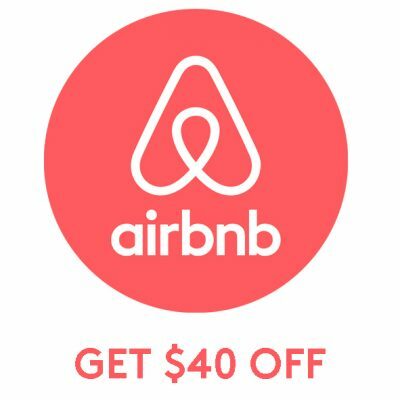 While it may be a little pricier than other places, by Albanian standards, it’s a great place to go to. The staff is super friendly, the service fast and the food mouthwatering. 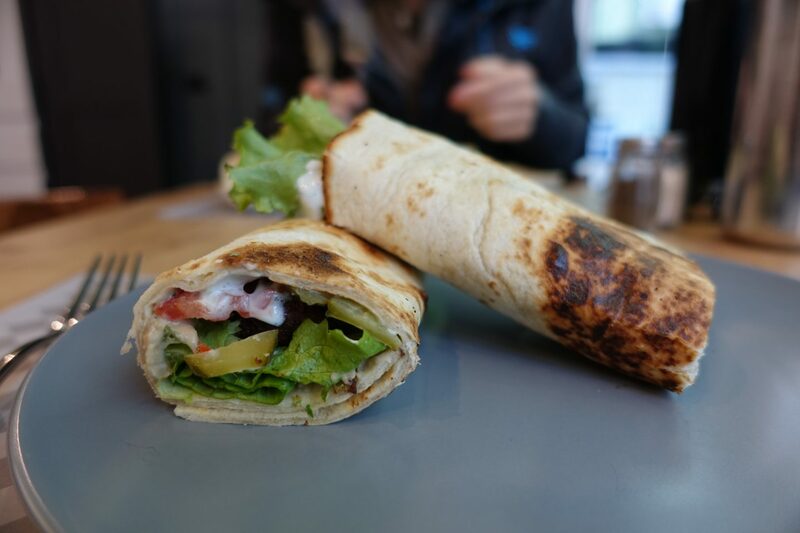 If you can use a small bite order their falafel wrap (350 ALL) and if are incredibly hungry go with one of their burritos (550 ALL). If you are feeling music and good vibes then head to City Art, a bar on Rruga Mustafa Matohiti, were they have a yummy veggie burger (380 ALL). While most supermarkets offer plant-based milk alternatives I had a hard time finding tofu, vegan cheeses and the like. While I am a lover of tofu, I don’t care much about the rest and I was therefore not looking too hard. 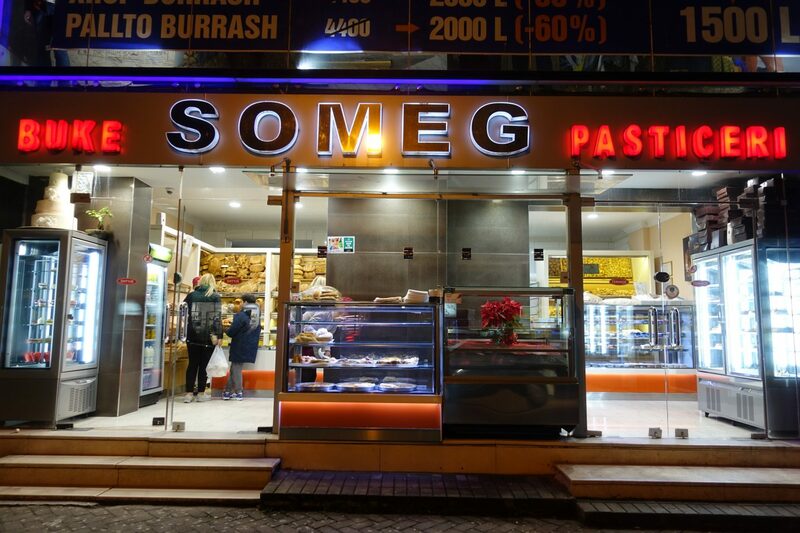 However, Baronesha on Rruga Sami Frashëri, pleasantly surprised me with its selection of vegan specialty items. Baronesha is a heaven for expats looking for that one thing that’s not available anywhere else. The store houses products from all over the world, including heaps of vegan specialty items: vegan cookies, cheese, burger patties, tofu and a huge selection of plant-based milk alternatives. 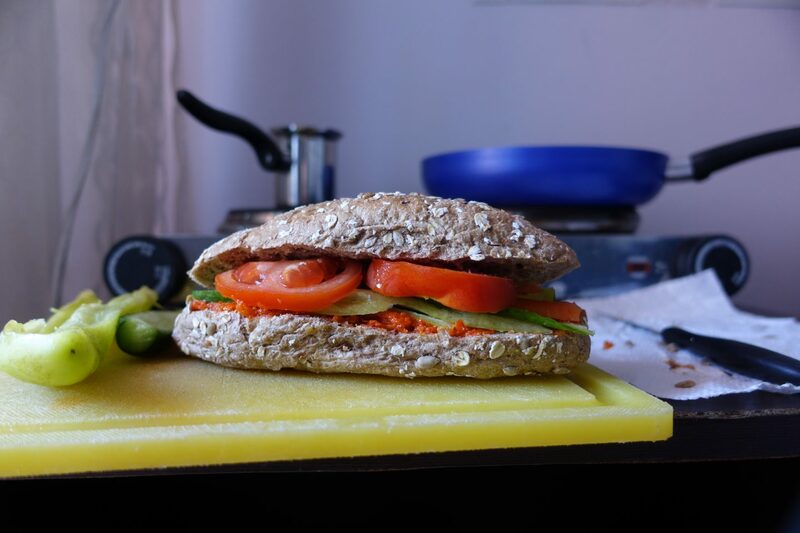 I always carry snacks such as apples and carrots with me and whenever I was out for lunch I made sure to carry a homemade veggie sandwich with me. It takes a couple of minutes to prepare and is absolutely delicious! Pop into supermarkets or buy fresh fruit and vegetables at street vendors. For bread and rolls hit the local bakeries, while most supermarkets offer them, they’re way better and fresher at the bakeries. 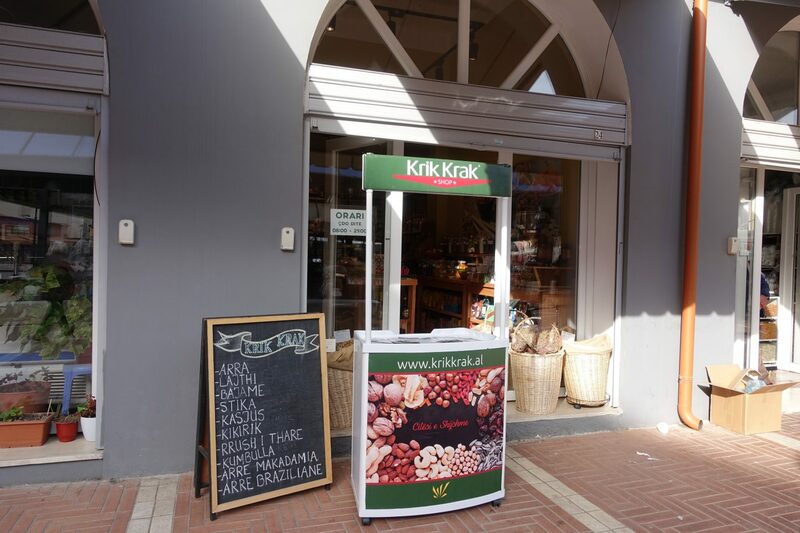 Krik Krak at Pazari i Ri market is a small shop that’s right next to the market. There you find figs for 750LEK per kilo, and an abundance of nuts and sweets in bulk. Neranxi is also worth mentioning, it’s a small store located in the basement of the ring center. The store offers heaps of goods in bulk: dried fruit, nuts, seeds, spices and herbs, all sold per kilo. If you are in need of a snack, love shopping in bulk and/or would just like to have something sweet, then this is your place. 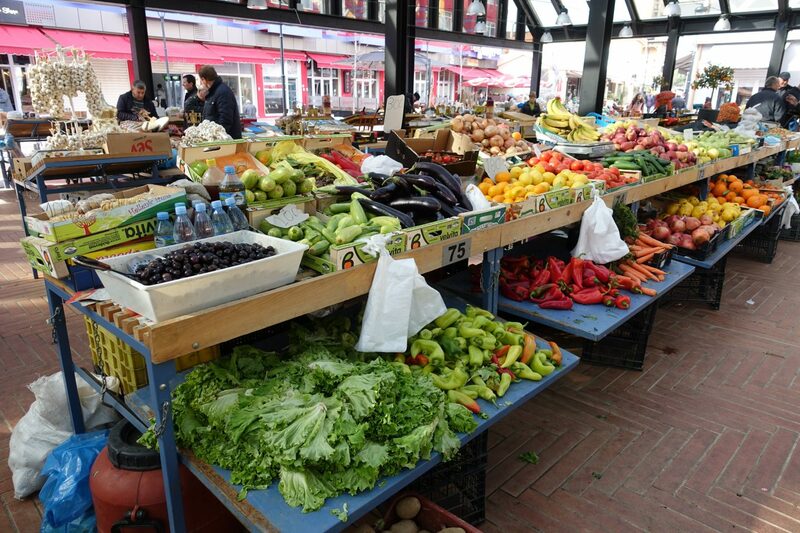 Pazari i Ri is a small market that offers fresh fruit and vegetables, legumes, nuts and spices. Although there weren’t too many tourists around the market itself did feel a little touristy. Make sure to compare prices prior to purchasing anything. It’s a great place to grab figs, lots of vendors have them and most of them offer them at reasonable prices. Did you say vegan cheese? 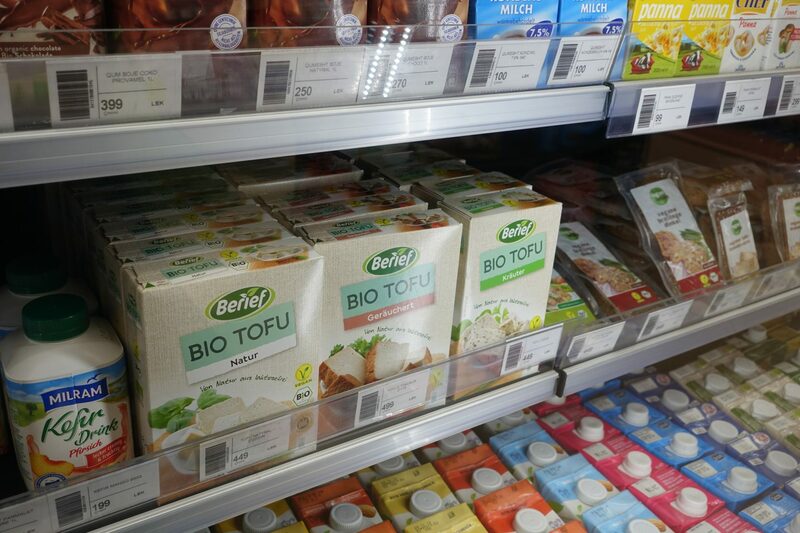 Was vegan milk and tofu in all Tirana groceries or just the organic store? Was it crazy expensive?